Home sales in the top 10 cities - Ahmedabad, Bengaluru, Chandigarh, Chennai, Hyderabad, Kochi, Kolkata, Mumbai Metropolitan Region (MMR), National Capital Region (NCR) and Pune - have declined at a compound annual growth rate of 8% since 2011. The demand for residential property is unlikely to revive in 12-18 months as the fundamental problem of lack of end-user buyers might not change anytime now, CRISIL Research has said. Absorption of new homes has been on the slide for more than six years now. “The trend appears set to last well into FY19 or beyond, portending more pain for developers,” it said. CRISIL listed six reasons for its prediction. First, high property prices have turned end-users into fence-sitters in most micro markets. Though capital values have been under pressure over the past few quarters, a significant chunk of supply in many micro markets was unaffordable, it said. Second, concerns over job losses and lack of employment opportunities - especially low-skilled ones such as in IT/ITeS - on account of increasing automation, among other things, were increasing. This has curtailed income visibility required for a housing loan, it said. Third, rentals were being preferred to buying a property as high prices meant hefty down payments and equated monthly instalments. Many nuclear families were opting for rental accommodation in suburban locations than purchasing a house in a peripheral micro market, it said. Fourth, there have been risks associated with delivery of under-construction projects, especially delays in getting possession from the developers. Resurgence in buyers’ confidence would happen only when they see the Real Estate (Regulation and Development) Act or RERA working in their favour. Fifth, participation of the investor community has reduced significantly on account of falling returns on the asset class, owing to stagnant capital values, limited income tax benefits on let-out properties (announced in Budget 2017-18), and changes in the regulatory framework to curtail pre-launch transactions. Sixth, until recently, developers were focused on mid-category/ luxury/ premium housing projects. This has led to huge unsold inventory, especially in the mid-segment, which is beyond the reach of the average buyer. The affordable housing segment has pent-up demand, and also favourable policy interventions, but developers have only just shifted focus to it. 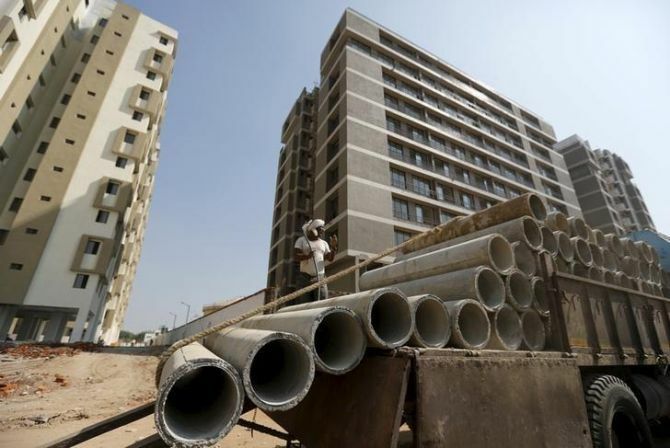 Prasad Koparkar, senior director, CRISIL Research, said, “The next few quarters will see more launches in the affordable housing category, or projects with smaller configurations, leading to a reduction in the overall ticket size. In the medium term, effective implementation of RERA can help infuse transparency and improve buyer confidence. While most states and Union Territories have notified their respective Acts, many are yet to form permanent RERA authorities. In addition, only a handful of state Rera websites - in Gujarat, Karnataka, Maharashtra, Punjab, Tamil Nadu and Uttar Pradesh - are operational and have started publishing project information online. Also, one sees a dilution in the definition of ongoing projects in the notifications of some of the states. These need immediate and effective monitoring by the central authority, it said. “We see prices hovering at current levels on account of weak demand and moderation in new supplies,” CRISIL said.